On a farm in West Goshen Lewis Norton made one of the more unusual and popular foods of the 19th century. Inspired by a sample of cheese his uncle brought back from Holland in 1808, Norton patented and sold blocks of cheese shaped like pineapples. They quickly became one of the most popular housewarming gifts of the time. Starting in 1809, Norton began collecting curds from milking cows on his farm for the purposes of making pineapple cheese. 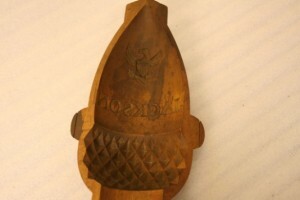 He pressed the curds in wooden pineapple-shaped molds to give them the desired shape. After removing the molds, Norton placed the product in nets, dipped it in hot water, and hung it in two rooms above the kitchen to age. As the cheese aged, the netting cut diamond-shaped markings into the sides, which resembled the pattern found on pineapples. The very oily cheese then received a coat of shellac to protect it against mold and to keep the oil from seeping out. Norton patented his process in 1810 and soon found high demand for his unique product. By the middle of the 19th century, Norton regularly acquired curds (and then milk) from nearby farms to keep up with the demand for his pineapple cheese, and he built a factory alongside his house in 1844. His factory is believed to be one of the earliest cheese factories in the US. Lewis died in 1860, but his family continued to operate the prosperous business. Requiring roughly 10 pounds of milk to make 1 pound of cheese, the Nortons purchased 1 million pounds of milk to meet demand in 1888. The following year, records indicate that the Nortons sold their cheese in two-, four-, and six-pound sizes for 35¢, 65¢, and 85¢, respectively. Production records in 1889 show that the Goshen factory produced 2,592 two-pound cheeses, 12,474 four-pounders, and a whopping 33,346 six-pounders in one year. As milk prices steadily rose in Connecticut, the Nortons found it increasingly difficult to maintain their operations in Goshen. Eventually the Nortons found it cheaper to operate out of western New York, where they had greater access to rail transportation and inexpensive sources of milk. Years later, the Kraft Cheese Company purchased the Norton business, continuing to sell its products until 1931. “Broadside, Lewis M. Norton’s Brand of Pineapple Cheese.” Litchfield Historical Society, Helga J. Ingraham Memorial Library, 2013. Link. 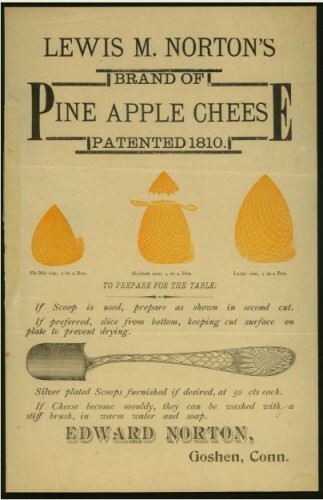 “Catalog Record of Myron Norton’s Patent, Improvement in the Mould for Pressing Pine Apple Cheese, October 13, 1830.” Litchfield Historical Society, Helga J. Ingraham Memorial Library, 2013. Link.